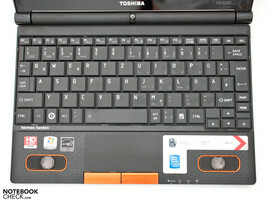 Back at the beginning of December 2010, Toshiba announced several new products in its netbook portfolio. Alongside the NB550D, the top model with high-quality Harman Kardon speakers and an HDMI port, there is also the NB520 with the latest Intel Atom N550 dual-core processor. However, the NB520 comes without HDMI, providing only a VGA port for video output. In keeping with the Toshiba NB550D’s multimedia focus, it comes equipped with the new AMD C-50 Accelerated Processing Unit (APU) along with an integrated AMD Radeon HD 6250 graphics unit. With a speed of 1 GHz, the dual-core entry-level APU is nominally weaker than its opposite number from Intel, but the DirectX 11 graphics unit is there to provide acceptable 3D performance as well as HD acceleration. The hardware set-up also includes 1 GB of DDR3 RAM and a 250 GB hard drive, widely viewed as standard. The most immediate downside to this netbook seems to be the glossy screen, with a diagonal measuring 25.7 cm (10.1 inches). We examine the Toshiba NB550D’s best and worst features, particularly the Ontario Fusion APU from AMD. 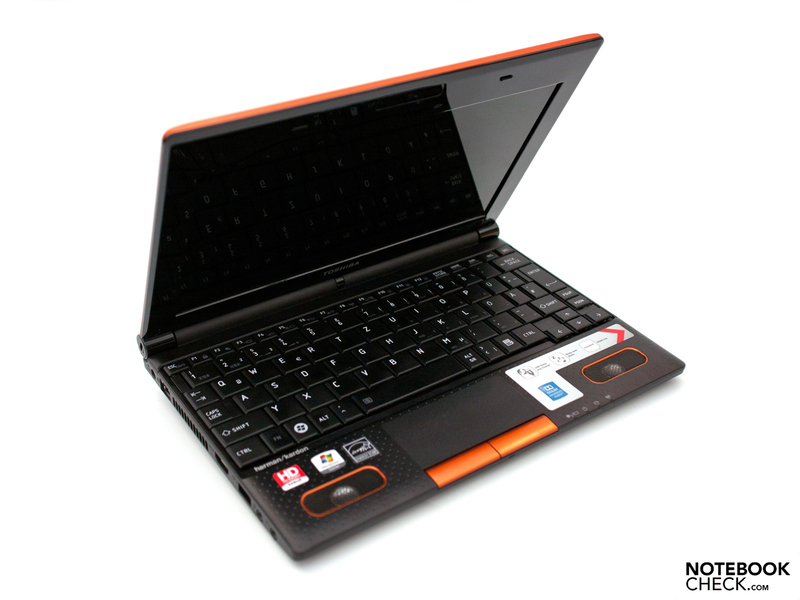 The netbook is out now, priced at €349 (RRP) including tax. 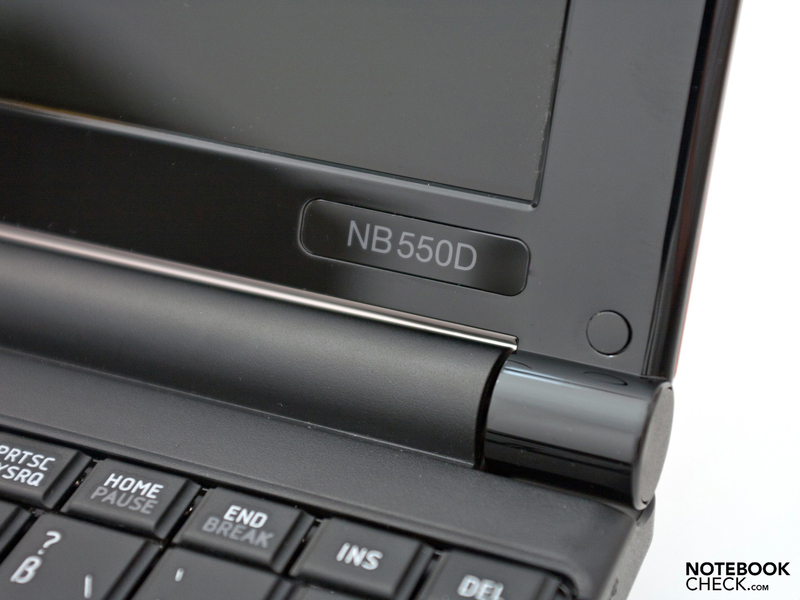 The Toshiba NB550D’s casing is based extensively on that of the NB500, other than the speakers in the palm rest. The matt plastic surfaces have a high-quality look, and the overall workmanship is convincing. The non-slip, rubberized surfaces below the keyboard and in the region of the lid are an unusual feature; as well as having a nice feel to them, these guard successfully against scratches and a build-up of dirt or dust. It does seem like the upper part of the screen bezel is a little oversized as a result of the large palm rest. 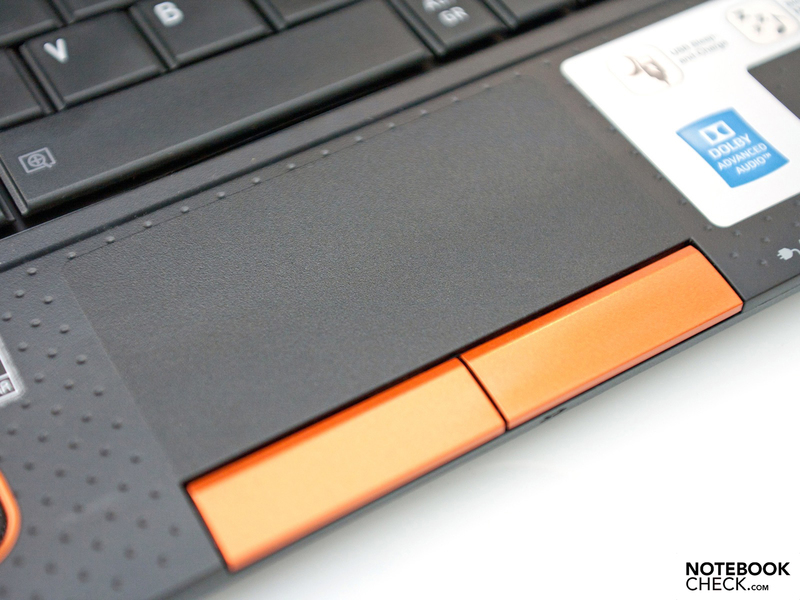 Though the case is mostly black, the netbook still manages to stand out from the crowd; the rubberized surface of the lid comes in either metallic brown, metallic lime-green or metallic orange, depending on your taste. Other than that it is a very straightforward, uncomplicated design, tapering towards the front for ease of use. The netbook is for the most part robust. The keyboard flexes only in the central region. The hinges stick out from the back of the lid and hold it firmly in place, though we did notice some wobbling of the lid. Why Toshiba decided to make the screen bezel glossy, despite the rest of the case being matt, is a mystery, as the glossy surface has a tendency to pick up dust and scratches. 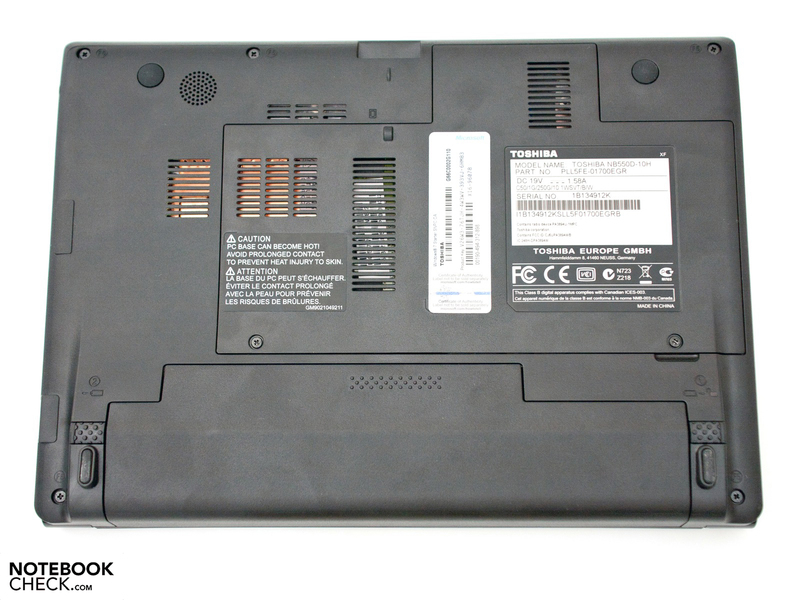 The netbook’s dimensions of 262 x 190 x 16.6 - 35.5 mm, and its weight of around 1.27 kg including the six-cell battery which it comes with, are within the normal range for a netbook with a 10-inch display. The relatively large access panel on the underside of the base unit is a pleasant surprise, allowing you to change the RAM or hard drive in minutes. Toshiba has chosen to leave off the VGA port, often used but slowly dying out, and offer only the more modern HDMI port. It is one of the first manufacturers to do this. 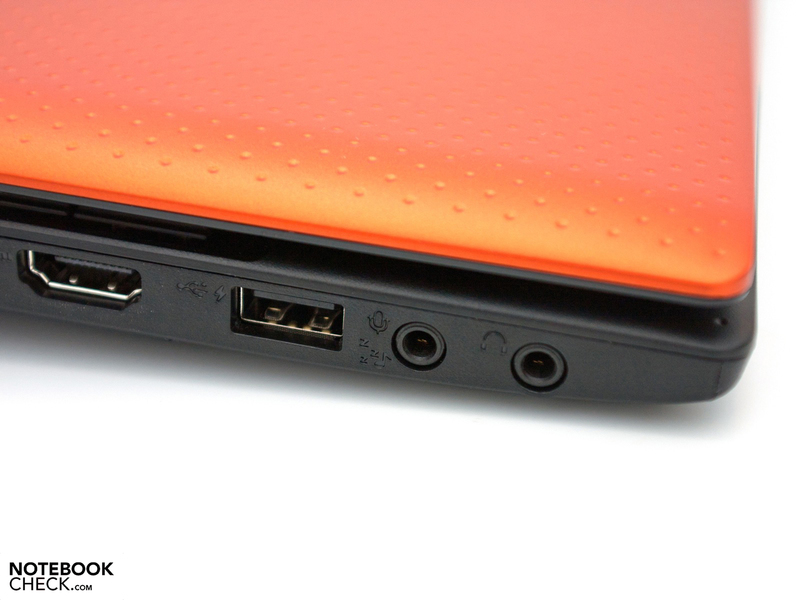 Other than that, the NB550D comes with the standard range of ports. There are three USB 2.0 ports, an RJ-45 network port, two audio ports without support for S/PDIF, and a 2-in-1 card reader tucked under the front edge. Toshiba has not included a USB 3.0 port, the latest standard, but it does earn brownie points through two nice features. The first is the familiar Sleep and Charge function on the left-hand USB, and the second is that the Harman Kardon speakers can also be used while the netbook is switched off. Toshiba calls this new function ‘Sleep and Music’. With the help of a male to male audio cable, you can play songs straight from your MP3 player without starting up the computer. The speakers are powered during this by the six-cell battery, in a similar way to the USB charging function. The netbook’s wired connectivity does not conform to the latest Gigabit standard, with a 10/100 Mbit Realtek PCIe FE Family Controller. On the other hand, the netbook has 802.11 b/g/n WLAN as well as Bluetooth 3.0 +HS, so it is well-equipped for wireless communication. Inside the case there are hints that a UMTS module for mobile internet access could feature in future models. 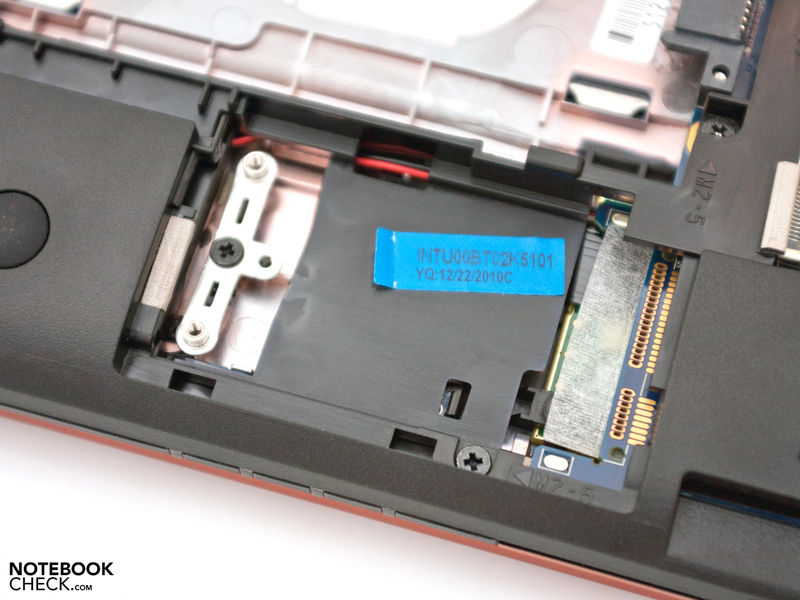 Unfortunately, this netbook does not have a soldered SIM slot or a WWAN antenna. Not much comes with the netbook other than the bare essentials for running it. The small box it arrives in contains a six-cell battery with 61 Wh, already inserted, a mains adaptor with power cable, a folded quick-start booklet and a handbook with safety instructions. Toshiba does not list any accessories specifically for the NB550D, though a wide range of peripherals is available. When it comes to software, however, the freebies are extensive; you get a wealth of programs that you don’t particularly need. They slow down performance and the majority can be categorized as bloatware. Toshiba offers a standard 24-month warranty (worldwide). It is a ‘bring in’ type warranty, where you have to send in the computer yourself or via the retailer. The warranty can be extended on this model to a maximum of 48 months, for an additional price of €109 (RRP). 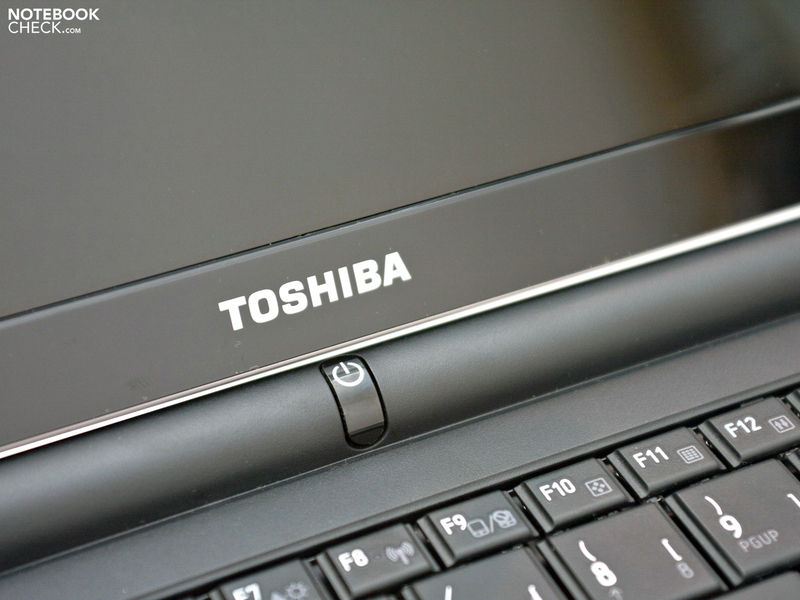 Toshiba’s on-site repair service is a little more expensive, available from €159 (RRP) and also running for 24 months. 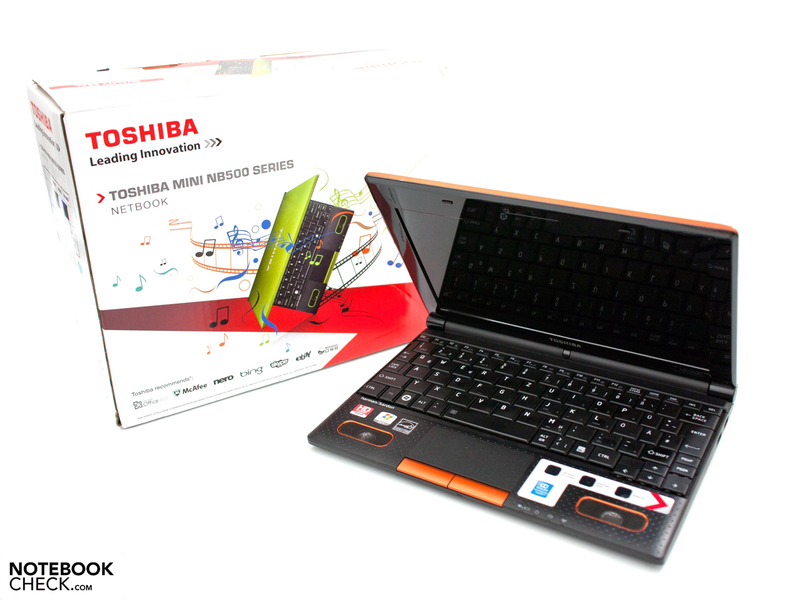 Further details about these packages can be found on Toshiba’s support page. The keyboard comes in the usual German layout, but the lettering on the keys is in English. Despite the edge-to-edge design of the keyboard, there are some keys on the right-hand side which are too small; for example the Shift and Enter keys are smaller than usual. The keyboard has a nice feel to it, giving clear tactile feedback with a short travel distance. Apart from in the central area, the keyboard is convincingly robust. 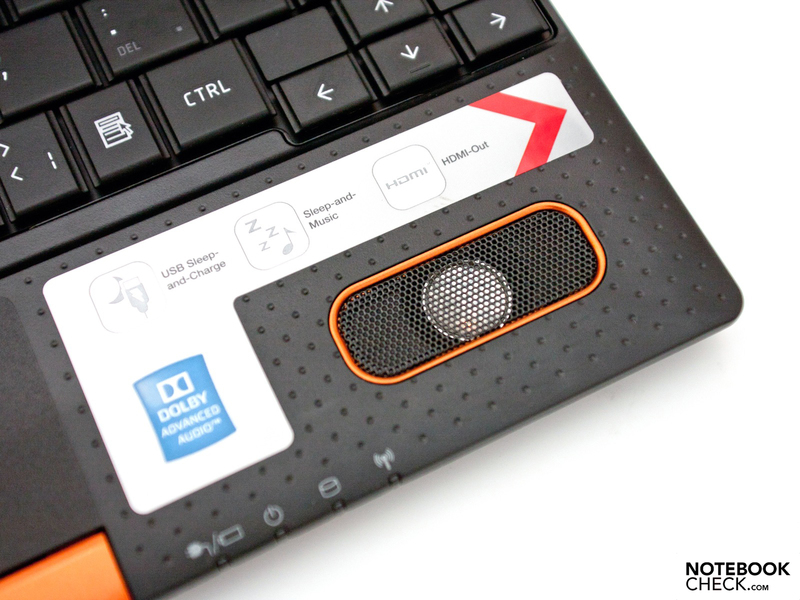 The NB550D comes with a generously sized touchpad. It is impressive with a diagonal of 9 cm, a broad design and rough surface. As well as the unmarked scroll bars, a variety of multi-touch gestures are recognized. Overall it is very easy to use. 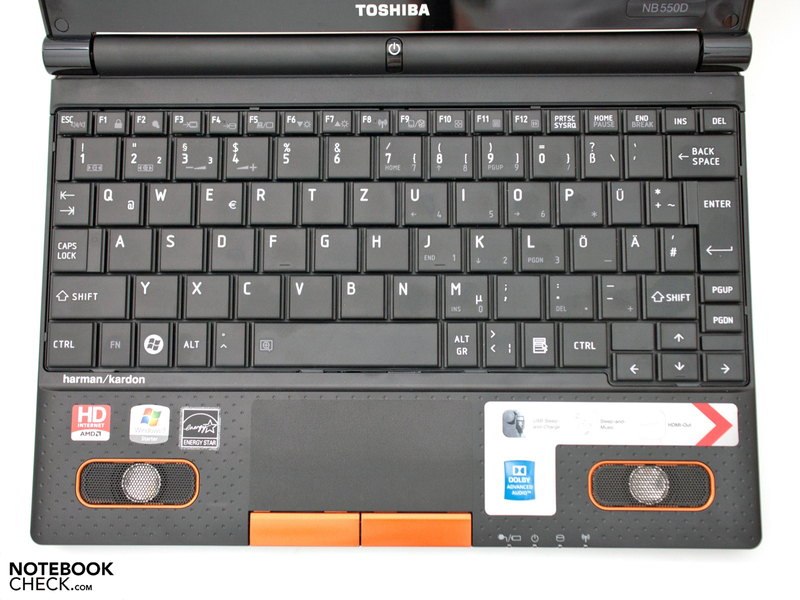 The touchpad keys are finished in the same colour as the netbook lid, and give strong tactile feedback. 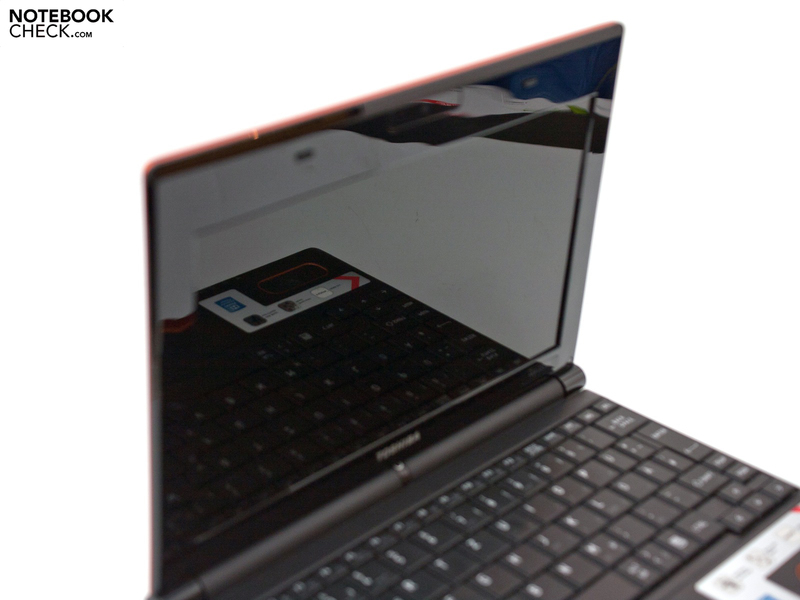 Having a glossy screen is a clear disadvantage for a supposedly mobile netbook (screen model AUO30D2). When the background picture is dark you can quite happily use the screen as a mirror. It has a diagonal length of 29.7 cm (10.1 inches) and a native resolution of 1024 x 600. Higher resolution levels or an optional HD version with 1366 x 768 resolution are not available. A matt screen would have been an altogether better choice here. Prime examples in this class of netbook would be the Asus Eee PC R101 or the Samsung NF310 with HD screen. The LED backlighting is convincing, producing a good brightness and even distribution. We measured a maximum of 245 cd/m², with an average of around 231 cd/m². There were no problems with the picture caused by variations in brightness. At 88%, the AUO screen has a good uniformity of brightness. All other readings are more or less average for a netbook screen. Black appears as slightly grey because of the elevated black level (1.35 cd/m²), and the contrast ratio which results from this is relatively poor. We had to go without an assessment of the colour space that the screen is able to depict, because we could not read the profile. However we strongly suspect that the display would not satisfy professional users, although to the naked eye the image clarity and colour reproduction do not give any cause for complaint. Outdoor use is hampered by the netbook’s glossy screen. It is possible to work in a shady spot or enclosed space, as the bright screen can still overpower most reflections in this situation. But, with a direct source of light behind you it becomes pretty much intolerable, forcing you to look for a better position. Unfortunately the viewing angles do not bring this section to a pleasant close. Horizontally the picture is stable even at quite wide angles, but along the vertical axis the picture grows a little fainter and rapidly inverts. The new Fusion Accelerated Processing Units, APUs for short, are AMD’s long-awaited response to Intel’s supremacy in the netbook field. In all there are four models to choose from for mobile end-user devices (AMD C-30, C-50, E-240, and E-350), offering speeds between 1.0 and 1.6 GHz. 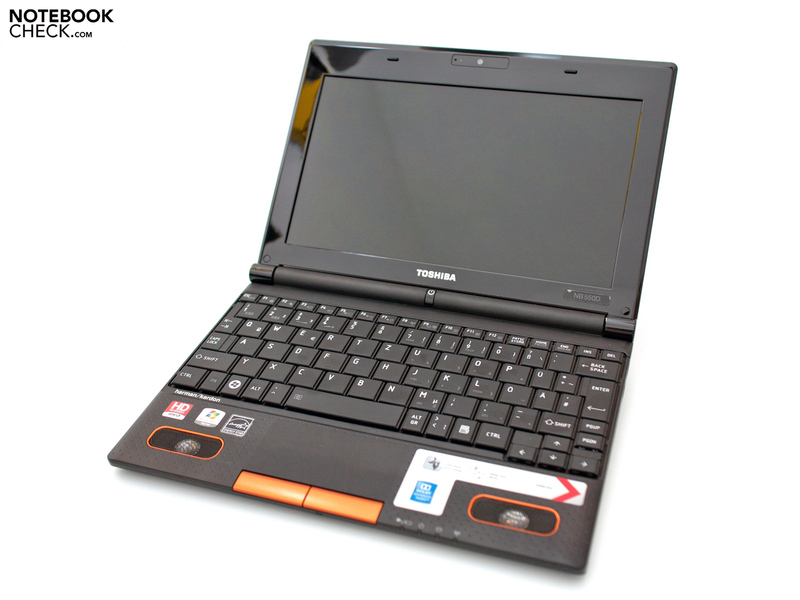 The Toshiba NB550D is based on the dual-core entry-level model, the AMD C-50 (codename Ontario, 1 MB L2 cache), with a speed of 1.0 GHz. In the C-50 APU, AMD has employed a new architecture designed to be used, like the Intel Atom series, in energy-efficient devices. Despite having a stronger graphics unit the thermal design power (TDP) is only slightly higher at 9 Watts; to compare, the Intel Atom N550 with an integrated GMA 3150 graphics chip has a TDP of 8.5 Watts. The advantage of AMD’s C-50 APU is the graphics performance more than the processor performance. The integrated AMD Radeon HD 6250 graphics chip (80 pipelines) offers a core speed of 280 MHz as well as support for DirectX 11 and Shader 5.0. But without independent video memory this chip is no guarantee of good gaming performance, and the focus should clearly lie on its HD playback. 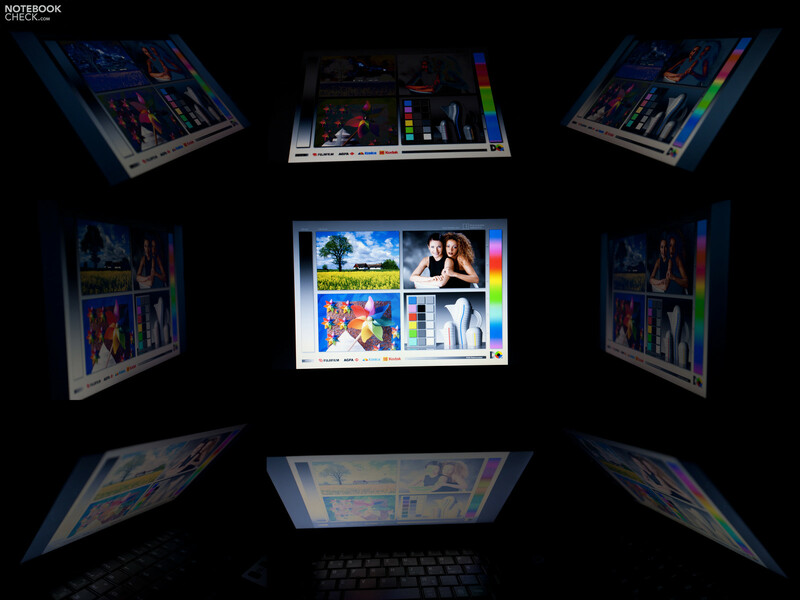 The graphics unit supports the decoding of HD content using the integrated UVD3 Video Decoder. 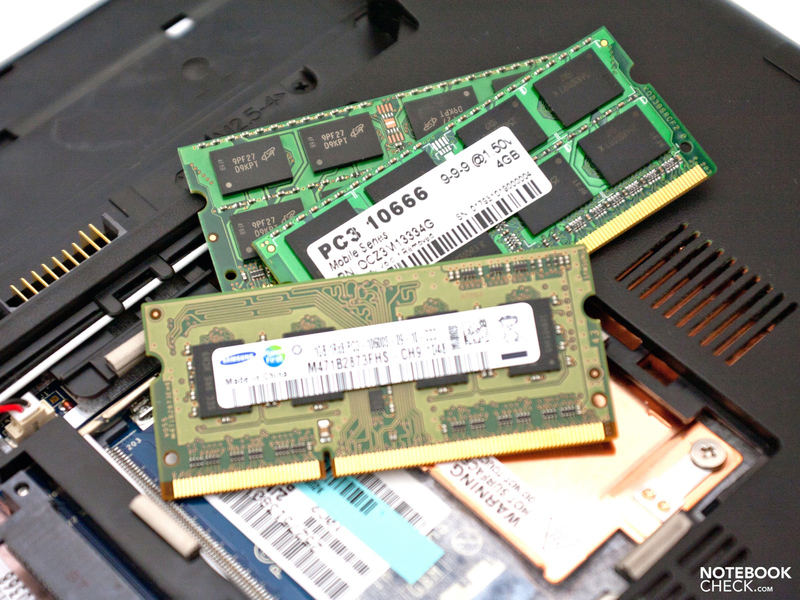 Alongside the APU components in the netbook’s chassis there is a 2.5-inch, 250 GB hard drive, along with 1 GB of Samsung DDR3-10600S RAM. The hard drive can be swapped for a variety of other hard drives thanks to is standard height of 9.5 mm. The RAM is not so obliging in this respect. 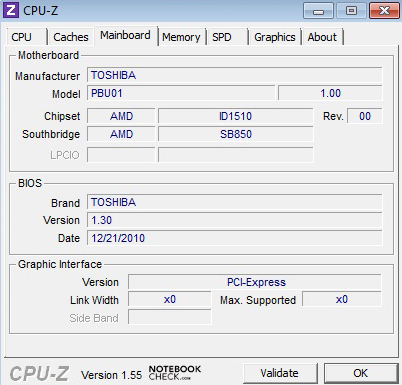 Firstly it only has a speed of 667 MHz, and secondly, Toshiba appears to have limited the maximum allowed memory. 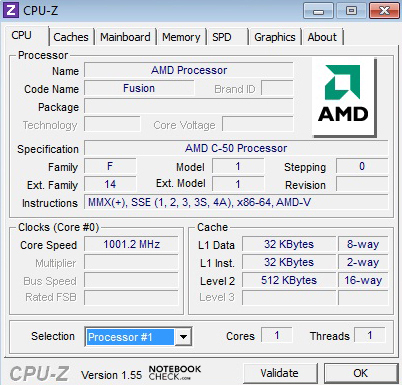 The AMD C-50 APU can use up to 4 GB in one bank via the A50M controller hub; during our testing we used a 4 GB Kingston module (type KVR1066D3S7/4G) which was recognized without a problem, but the usable amount was limited to 2 GB through Windows 7 Starter (32 Bit). 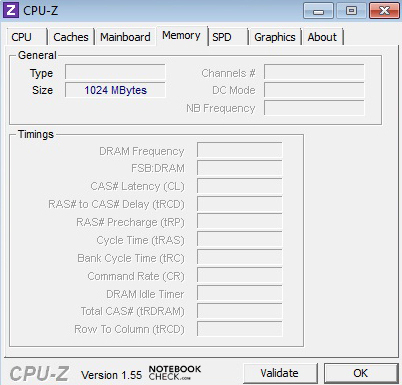 A faster OCZ module with a speed of 1333 MHz (type OCZ3M13334G) was not recognized by our test system. In the Cinebench R10 benchmark by Maxon the AMD C-50 can demonstrate its application performance. But with 1,212 points in the multi-core rendering, its performance is lower on average than the Intel Atom N550 with 1.5 GHz. In the OpenGL calculation the APU really stands out from the crowd with 1,234 points. 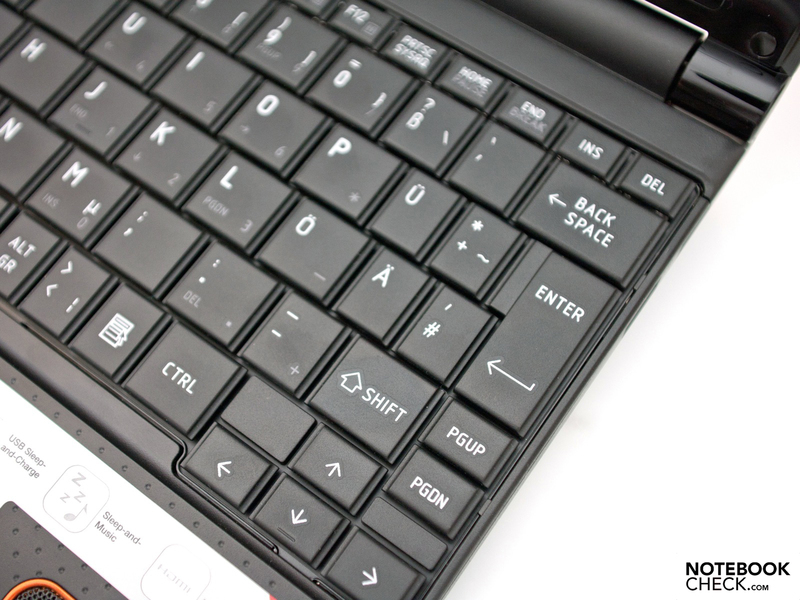 The Asus Eee PC 1015PEM only manages a weak 278 points (N550/ GMA 3150) here. It is on about the same level as the Asus Eee PC 1215N with an Nvidia Ion 2 graphics unit or the stronger Lenovo ThinkPad Edge 11 with Intel GMA HD, though the latter is equipped with a more powerful processor. The CPU arithmetic benchmark by SiSoftware Sandra (5320 MIPS/ 5530 MFLOPS) puts the APU roughly on par with processors like the AMD K125 or AMD MV-40. Older Atom processors (N270, N280 - single core - 3494 MFLOPS) trail behind the C-50 APU as well as the AMD K125 or MV-40. The C-50 APU’s lead is a hefty 58% in this test. On the other hand, Intel CULV processors like the Intel Core 2 Duo SU7300 are considerably faster in turn (8790 MFLOPS), by around 37%. Intel’s N550 dual-core Atom is also remains ahead with around 6,365 MFLOPS. 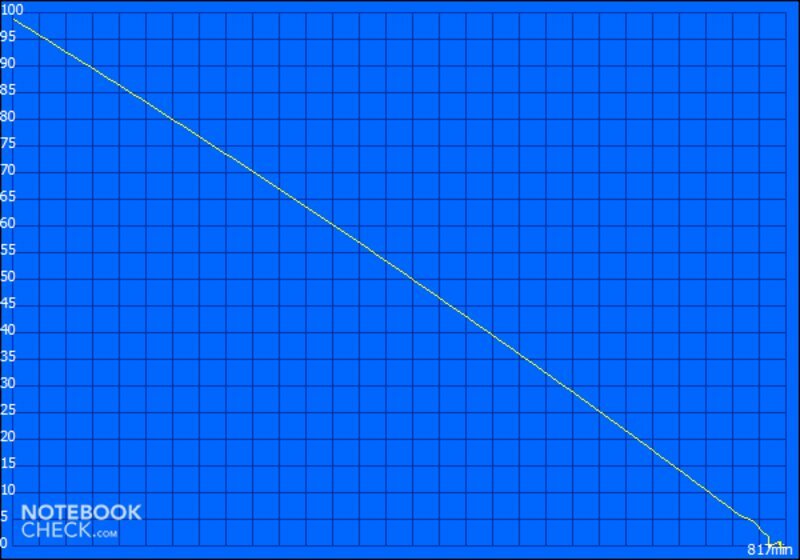 The 2M calculation by Super PI produces a similar result. The AMD C-50 APU completes the task in 170 seconds, whereas an Intel Atom N280 takes around 20 seconds longer (192 seconds, 20% slower). The Intel SU7300 is almost 93% faster at 88 seconds. The N550 lags behind here with 217 seconds. Overall the AMD C-50 APU can be placed in the lower third of our CPU table. In terms of performance the processor is at roughly the same level as the Intel Atom N550, depending on the benchmark used. 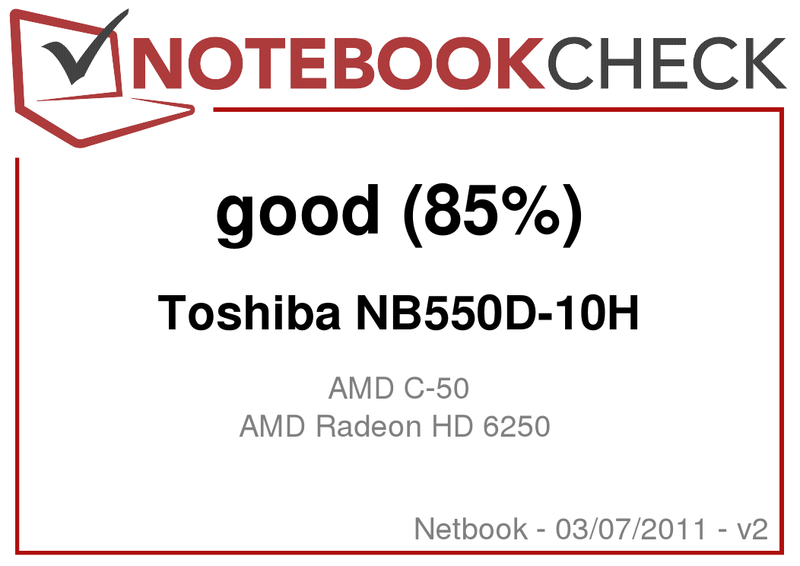 In the PCMark Vantage system benchmark, which examines all system components rather than just the CPU, the Toshiba NB550D scores 1,438 points. Machines with an Intel Atom N550 come out ahead in this benchmark, despite the slower graphics card. For example the Samsung NF310 scores 1,671 overall, while the Samsung NP-N150 Eom with a single-core Atom N450 CPU scores less at 1,332 points. In Windows 7’s own performance index, the processor is shown to be the weak spot, scoring only 2.8 of a possible 7.9 points. You can also reach this conclusion just by working with the netbook. The windows take quite a long time to appear and load times are unreasonably long. With a RAM upgrade to 2 or 4 GB the situation improves somewhat, with Windows running much more smoothly. After the upgrade the RAM score rises from 3.9 to 4.6 points, and so we can definitely recommend upgrading to at least 2 GB. In the synthetic gaming benchmarks by Futuremark, the AMD Radeon HD 6250’s performance was impressive for a netbook. In the 3DMark 06 test it scored 1,448 points, around 300 points more than the Asus Eee PC 1015PN with Ion 2 graphics (1,155 points). 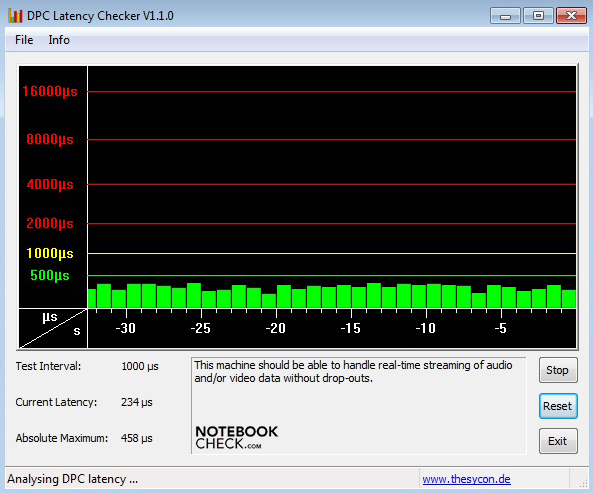 Netbooks with the integrated GMA 3150 do not achieve anything of note in this test (Eee PC 1015PEM, 147 points). 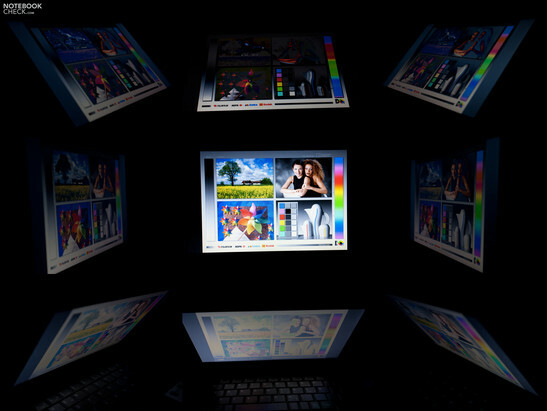 So all in all this is a respectable performance, though comparing it to a modern multimedia notebook will show that you need to look elsewhere if you want truly acceptable, up-to-date graphics performance. 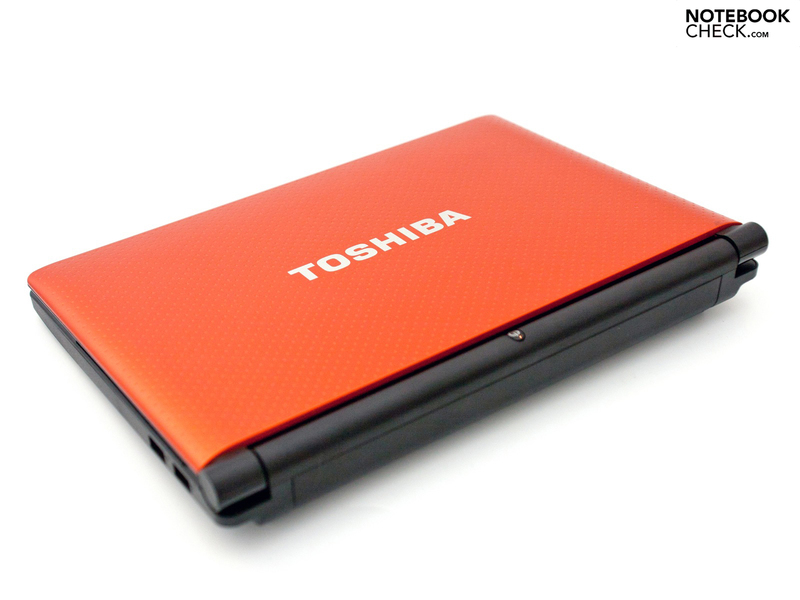 Toshiba has used a 2.5-inch hard drive of its own make as the netbook’s storage medium. The MK2565GSXN drive has a total capacity of 250 GB and works at 5,400 rpm. In these points it follows the widely used standard, and Toshiba does not offer any faster drives. 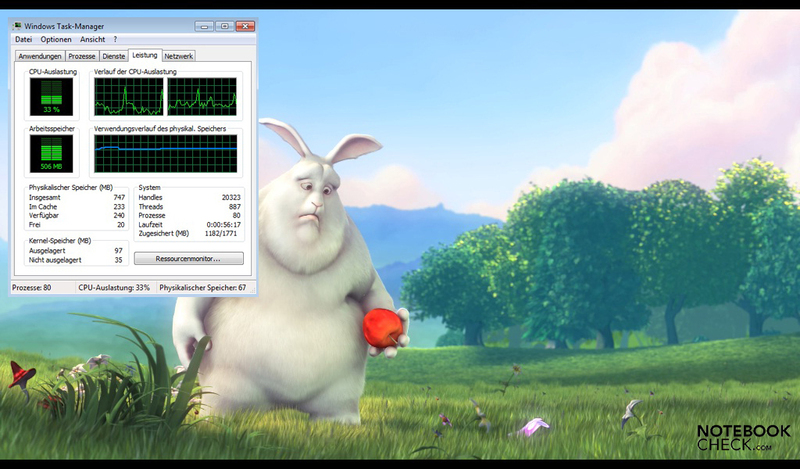 In the HD Tune Pro 4.6 benchmark its maximum transfer rate is an even 70 MB/s. 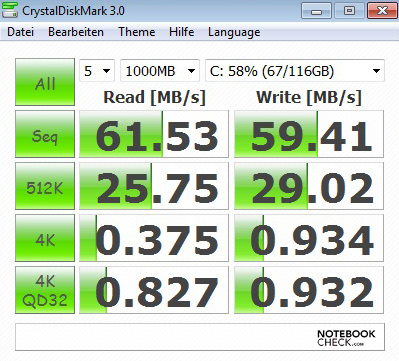 The CrystalDiskMark test confirms this average performance, with a sequential read and writing speed of around 60 MB/s. The average access time of 17.5 milliseconds is what you would expect from a drive of this sort. 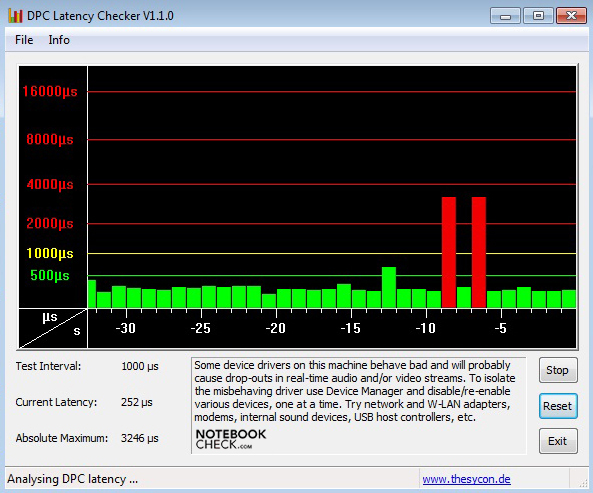 The DPC Latency Checker examines the latencies running Microsoft Windows 7. If these are too high it can cause interruptions or data transfer problems. A common issue is a crackling sound when using external sound cards. The NB550D is not wholly convincing here. When you activate the integrated WLAN adaptor, you get spikes into the red area of more than 2000 µs, at regular but relatively long intervals. 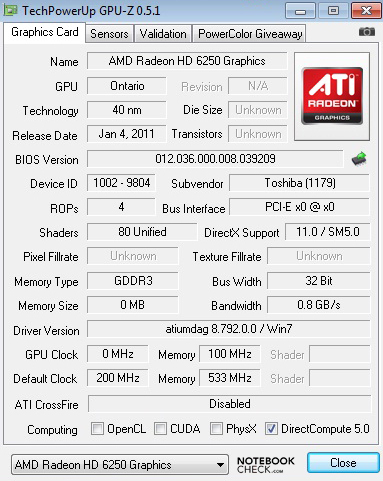 The real benefit of the AMD Radeon HD 6250 compared to the Intel GMA 3150 is the UVD 3 video decoder. This enables the smooth reproduction of HD video content without an additional decoder. Machines with the Intel Atom N550 and the integrated GMA 3150 graphics reach their limits with a 720p video (H.264) on YouTube. 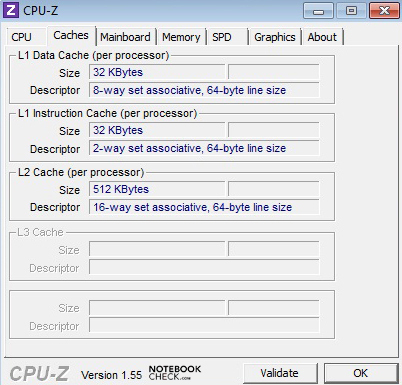 To achieve better performance, netbooks like this generally require a separate decoder (e.g. from Broadcom or Quartics), which there isn’t room for in a lot of machines. 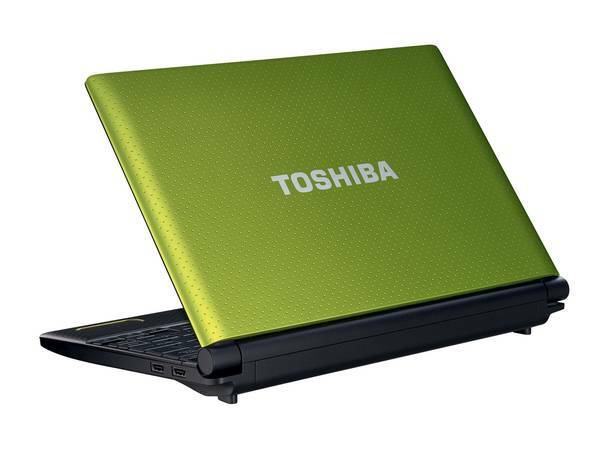 The Toshiba NB550D has no problems playing the usual HD videos with H.264 video compression. 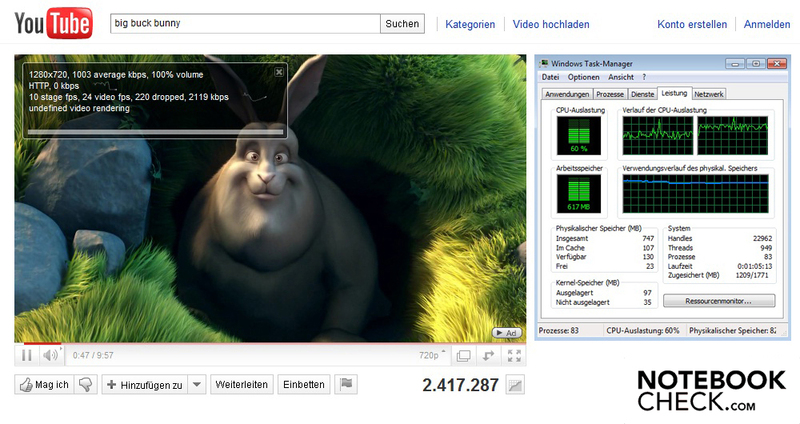 To test this, we watched ‘Big Buck Bunny’ both locally and as a Flash video on YouTube. 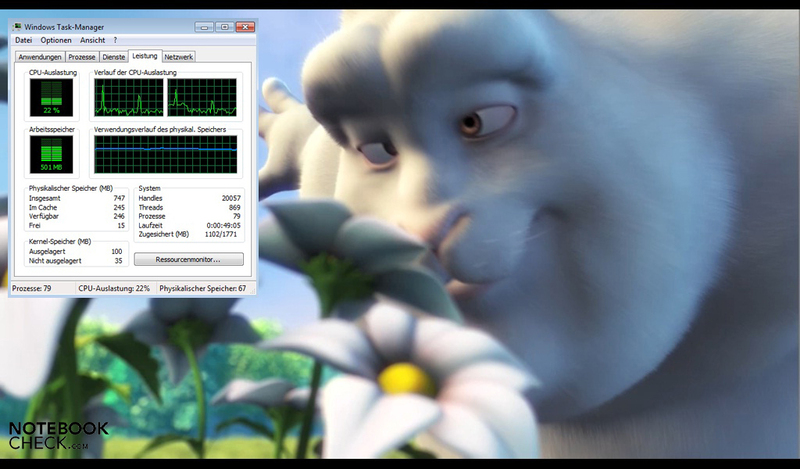 There were no problems at all with the local playback in 1080p (Full HD), with an average CPU load of 33%. Around 500 MB of the available 1 GB of RAM was used. 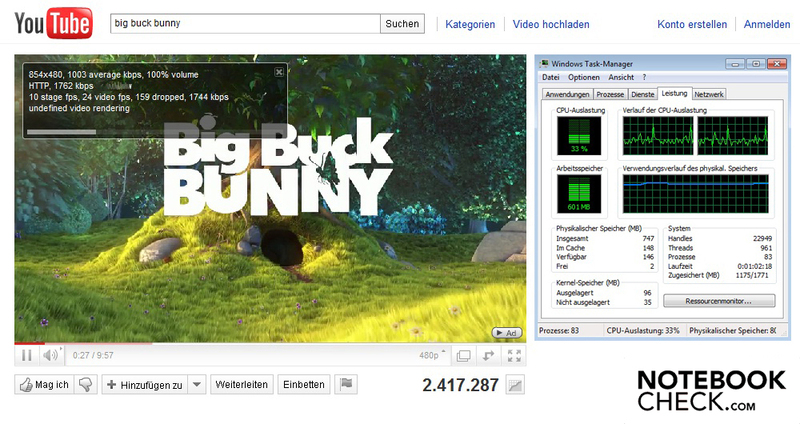 The same video in 1080p (1920 x 1080 resolution, 1003 kbps) watched via YouTube was more demanding for the hardware. 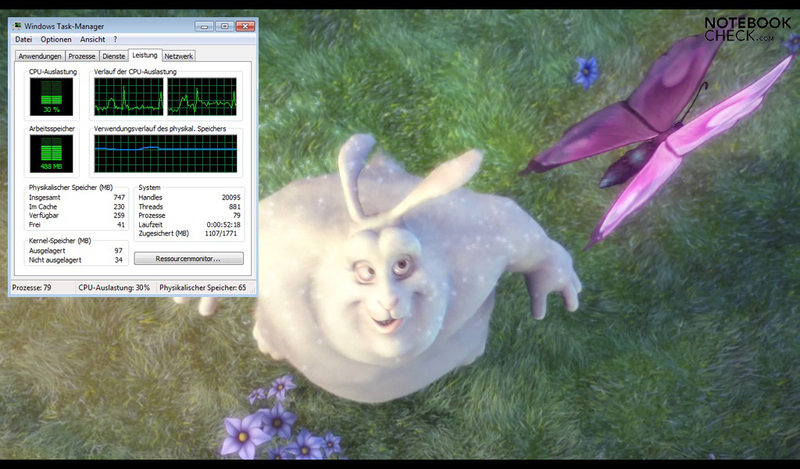 Playback was just about acceptable at 16 fps, but was a little sluggish in places. CPU usage climbed to 71% with about 600 MB of the RAM being used. As well as testing with Adobe Flash 10.1 (Final) we also looked at the new version, 10.2. However, this update did not bring increased performance. This is a clear improvement over the Intel Atom N550, although you have to watch out for the weakened office performance of our test system (1 GB of RAM). An update to 2 GB of RAM is recommended here as well. Compared to the Intel GMA 3150, the nominal core speed is only 80 MHz faster (280 compared to 200 MHz), and the AMD Radeon HD 6250 is basically also an internal graphics unit without independent memory. But despite this, the architecture is clearly different, offering substantially more processing power with 80 shader processors compared to the GMA 3150’s two. Playing the MMORPG World of Warcraft (WoW), the performance is solid (40 fps) on the minimum settings (GMA 3150: 5 fps, Ion 2 + N550: 46 fps). But if you turn up the details settings or try a more recent game, the frame rates plummet into the red. For better graphics performance it might be worth taking a look at the more powerful AMD E-350 Accelerated Processing Unit (HD 6310 GPU). 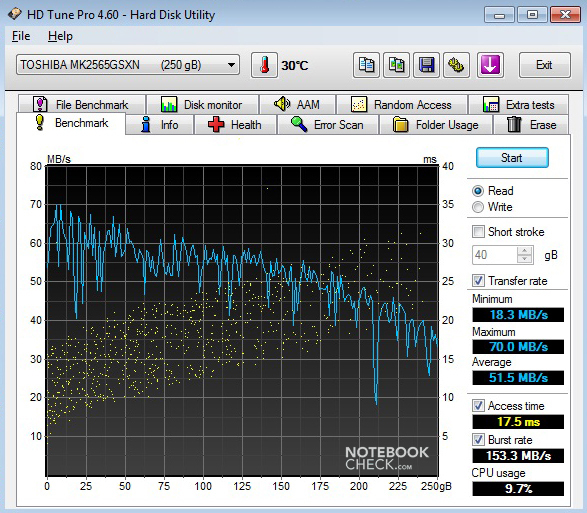 As the netbook has no DVD drive, only the small fan on the left-hand side of the case and the hard drive contribute to the machine’s background noise. In idle, the fan is mostly inactive. With light use (maximum idle) we measured a noise level of 34.0 dB(A). The 2.5-inch hard drive remained unobtrusive at 31.4 dB(A) thanks to its low speed. With heavy use, the noise rises to between 36.9 and 42.7 dB(A). In quiet surroundings this is clearly audible, but the fan does return quickly to a lower speed once the stress is over. The cooling system does a very good job. 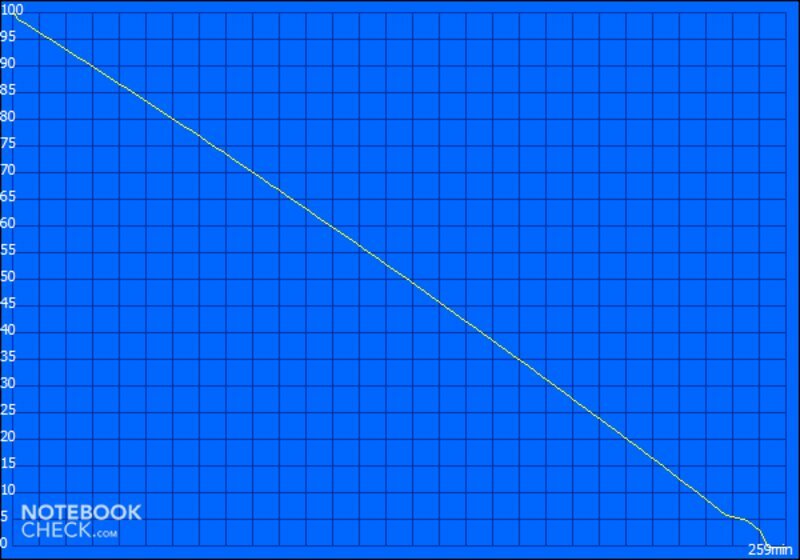 In idle the temperatures on the upper side reach a maximum of 27.6 degrees Celsius, remaining safely in the green or rather blue zone. With heavy use, the readings increase only slightly, with an impressive maximum of only 28.6 degrees Celsius on the upper side. The graphics unit reached a core temperature of 83 degrees Celsius at full load. (+) The average temperature for the upper side under maximal load is 25.2 °C / 77 F, compared to the average of 29.8 °C / 86 F for the devices in the class Netbook. (+) The maximum temperature on the upper side is 28.6 °C / 83 F, compared to the average of 33 °C / 91 F, ranging from 21.6 to 53.2 °C for the class Netbook. (+) In idle usage, the average temperature for the upper side is 23.1 °C / 74 F, compared to the device average of 29.8 °C / 86 F.
With Harman Kardon speakers, the Toshiba NB550D stands out from the crowd. The stereo speakers are located in the palm rest area and each has a power of 2 Watts. The sound quality is excellent but one could query the positioning of the speakers. However, during our testing the sound was only audibly affected when we completely covered the speakers with the front of our hands. 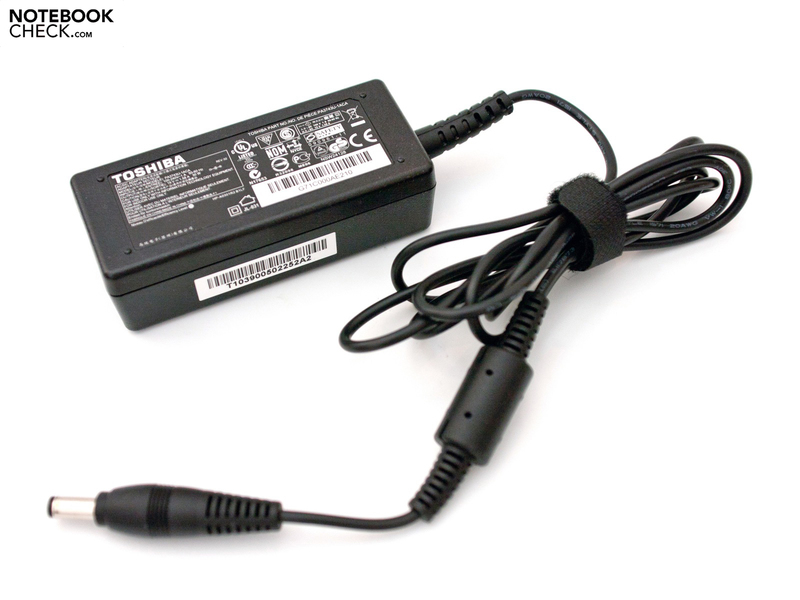 The Toshiba Sleep and Music function is a nice additional feature of the microphone socket. 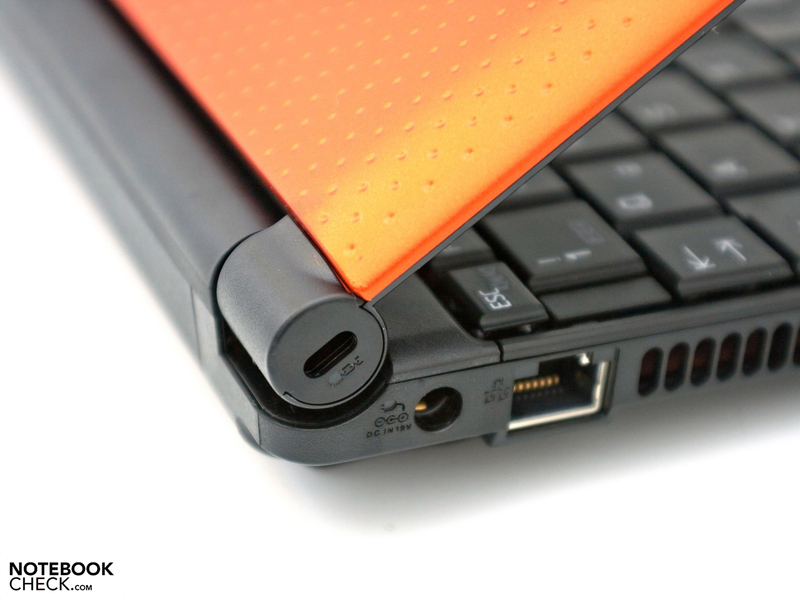 Using a male to male audio cable, the speakers can operate even when the netbook is turned off. For instance you could be using an MP3 player as the playback device. External speakers or your home cinema system could also be connected up using the 3.5 mm stereo jack or the HDMI output port. Despite its good performance the new AMD C-50 APU is not an energy-guzzler. At 9 Watts the nominal TDP is slightly higher than that of the Intel Atom N550 dual-core processor. But the energy usage readings that we took with our C-50 system in idle were between 5.4 and 8.7 Watts. 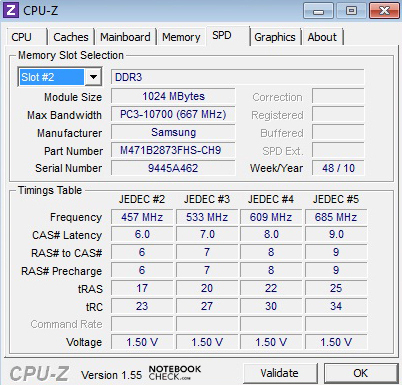 The Asus Eee PC 1015PEM uses around 2 Watts more on average. Under stress the higher energy demands of the AMD Radeon HD 6250 do make themselves known, driving the energy usage up to a maximum of 19.8 Watts. Toshiba has used a six-cell battery with a capacity of 61 Wh to cope with this energy consumption. In the ‘Classic test’ from the Battery Eater tool we establish the minimum battery life as a baseline. For this purpose an OpenGL calculation is used along with maximum screen brightness and activated WLAN adaptor. 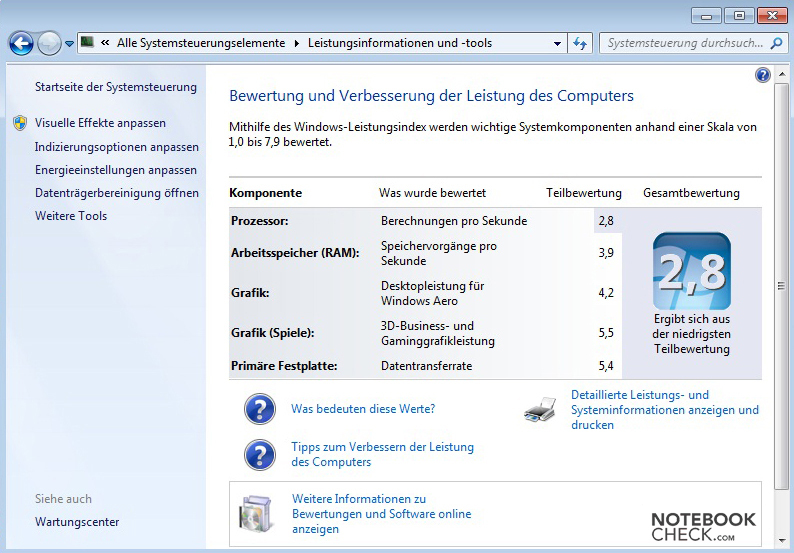 The Microsoft Windows 7 high-performance profile is selected. 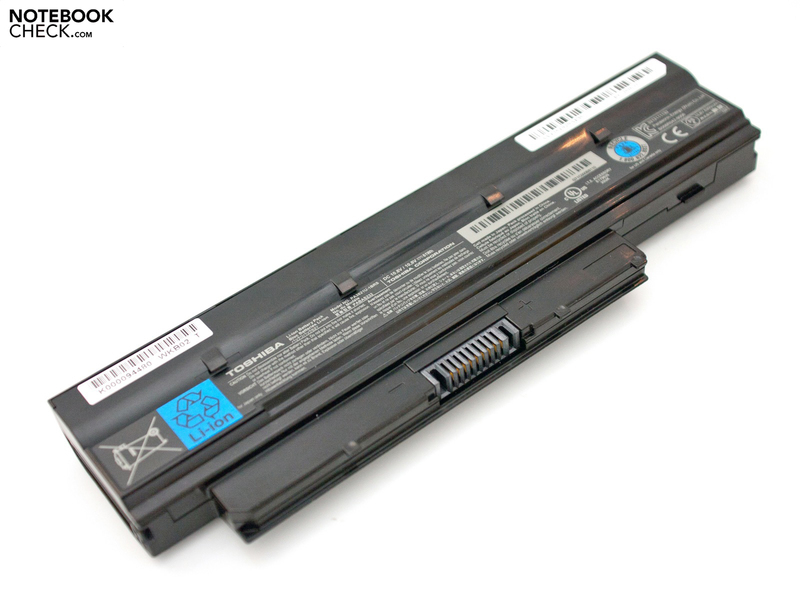 Thanks to its 61 Wh battery, the fully charged NB550D is exhausted after 4 hours and 19 minutes. 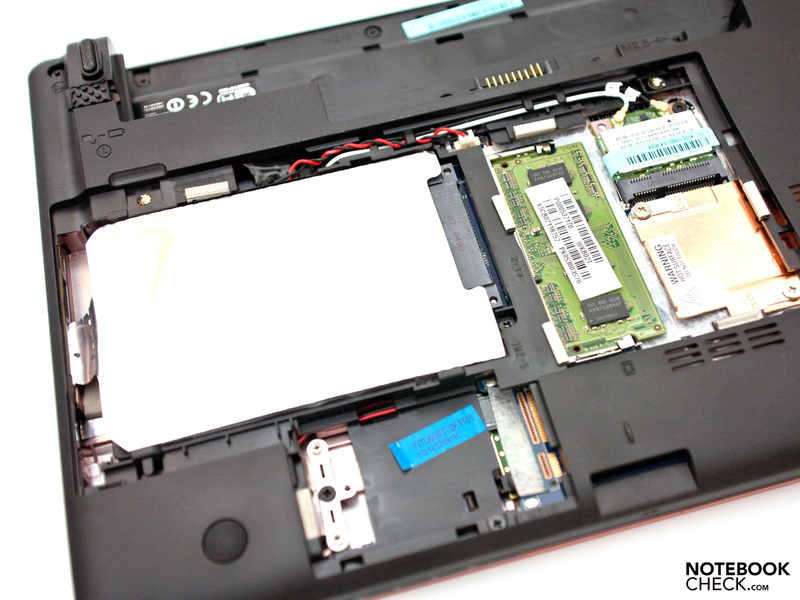 A comparable Asus Eee PC 1015PEM only lasts for 3 hours and 42 minutes in this situation. 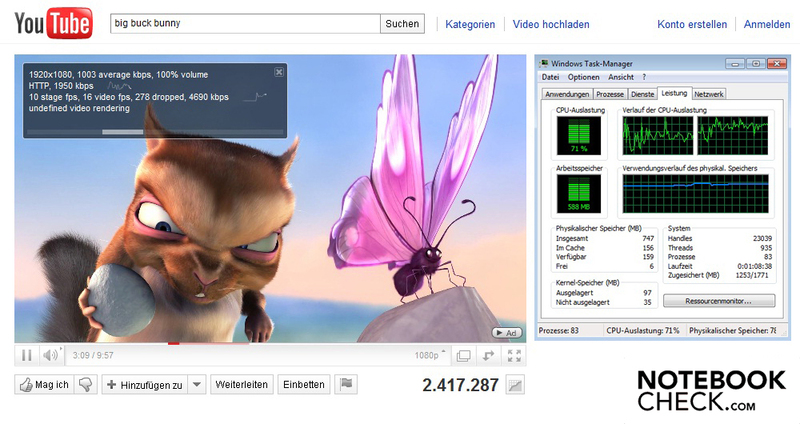 With nothing but WLAN usage and a comfortable screen brightness, a long runtime of 8 hours and 43 minutes is possible. This is almost on a par with the current maximum battery life for a netbook with Intel hardware. In the ‘Reader’s test’, which determines the maximum battery life by simulating the reading of a document, the netbook really pulls ahead. Only after an impressive 13 hours and 37 minutes do you have to look for another source of energy. So combined with the large battery, the NB550D with AMD C-50 APU is clearly out in front compared to the current Intel hardware with GMA 3150 graphics. The Toshiba NB550D netbook is an interesting machine, and an exciting alternative to many of the recent Intel Atom N550 systems, not least because of its hardware in the form of the new AMD C-50 APU including the AMD Radeon HD 6250. Its office performance is limited because of the 1 GB of RAM and a lot of bloatware in its initial state, but its smooth HD playback shows the potential of the netbook’s hardware. Another advantage of the NB550D is its large six-cell battery and low energy usage in idle. The design seems very unusual because of the large palm rest. The rubberized surfaces in bold colours have a good feel to them and are also robust. The port layout is the usual fare, but supplemented by nice additional features like Sleep and Music. The keyboard is not quite as convincing as the touchpad; the keys respond well but the tightly packed layout on the right and the English lettering on the keys are unnecessary failings. The Harman Kardon speakers on the other hand are one of the highlights, and they produce excellent quality sound. 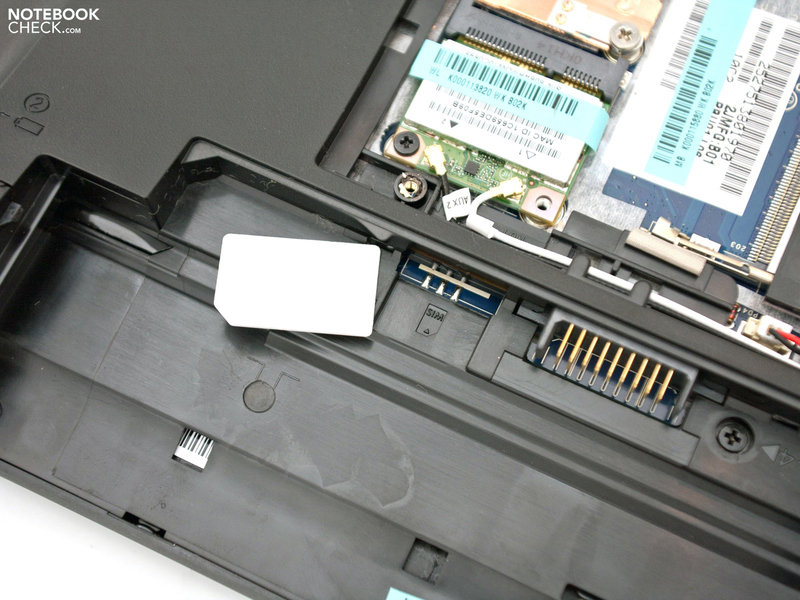 The glossy AUO screen is standard for a netbook. The price of €349 (RRP) is definitely in the right area for a 10-inch netbook. Machines with Intel Atom N550 processors are currently available for less, but with weaker graphics performance. High-quality Harman Kardon speakers are a real bonus. A 0.3 megapixel camera is good enough for your everyday video communication. The bottom of the base unit has a large access panel. The most important components are housed under it. ...a 250 GB hard drive made by Toshiba itself. 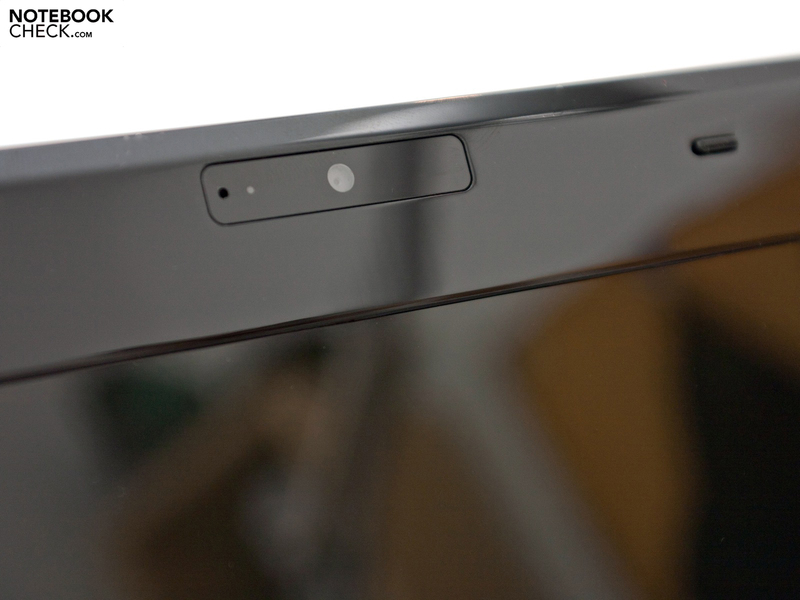 …a SIM slot hint at a possible UMTS version to come. A six-cell battery with 61 Wh gives good battery life. There’s not much room on the right side of the keyboard. The power button is easy to find, and doesn’t glow distractingly. 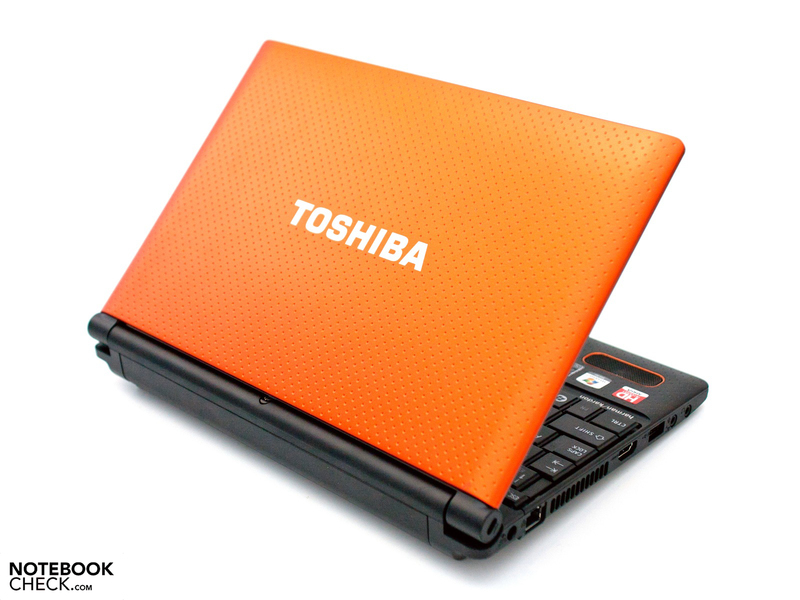 We review the new Toshiba NB550D, in orange. ... integrated DirectX 11 AMD Radeon HD 6250 graphics. ...and robust surfaces. The lid can be brown, green or orange according to taste. The model number “NB550D” is spelled out above the hinges. The hinges hold the lid firmly, but with a slight wobble. The usual range of ports, with some nice additional features. 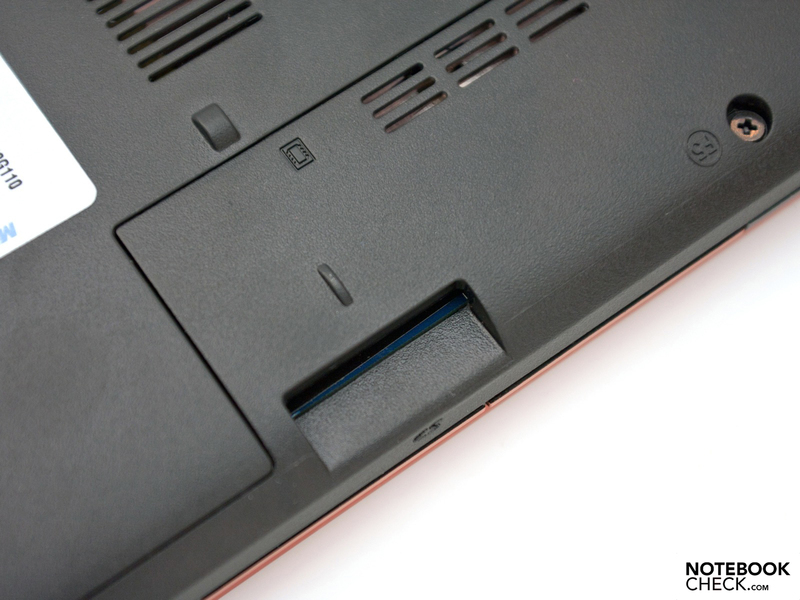 A 2-in-1 card reader tucked away under the front of the netbook. To match the small case, an equally compact mains adaptor. The rubberized surfaces, the long battery life and the comfortable touchpad. A base configuration of 2 GB of RAM, and a better, matt, screen. The impressive sound quality from the Harman Kardon speakers, the Toshiba ‘Sleep’ functions and the smooth HD playback. 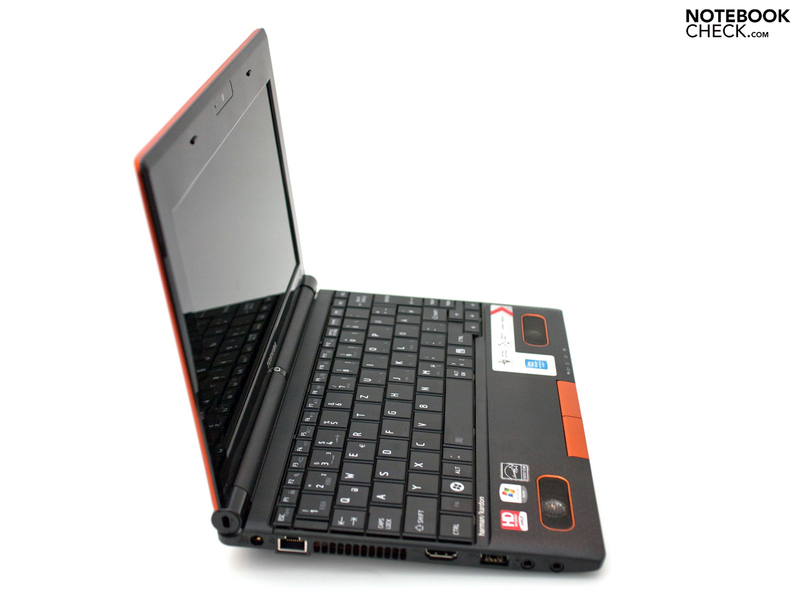 A wide range of netbooks with the Intel Atom N550 CPU, possibly in conjunction with Ion graphics, including the Asus Eee PC 1015PN, the Samsung NF310 or the Acer Aspire One D255. Also, any forthcoming netbooks with the C-50 APU, like the Asus Eee PC 1015B.